Over the New Year I took a trip up to Sunderland to spend some time with family, and also spend some time exploring the area. I've only just gotten around to sorting through my images, so I'll be adding a few posts in the coming days of my time on the spectacular North East coast. My first stop was Souter Lighthouse, located in the village of Marsden in South Shields. I parked up along The Leas, a two and a half mile stretch of magnesian limestone cliffs that date from around 250 million years ago. The cliffs have been named by the Geological Society of London as number 34 in the top 100 geological sites in the UK and Ireland. The Leas is famous for being the finish line for the Great North Run. When I arrived the weather wasn't looking particularly clement, just grey and damp, but I could see it was threatening to brighten up at some point, so I set off in the hope it wouldn't disappoint. It wasn't long before the sun appeared through the haze and bulky clouds began to calve off and drift away. One of the rock stacks, Marsden Rock is situated just to my left. This area of coastline is home to several rock stacks, including Marsden Rock, which used to be an arch, and was well documented and featured in many photographs, but in 1996 the arch collapsed, leaving behind two separate stacks. In 1997 the smaller stack was declared unsafe and was demolished in the interests of public safety. With the clouds breaking apart, a bit of sunshine lit up the scene. The wind was blowing a gale, as it often does on the north east coast, so more clouds were soon harried speedily across the ocean towards us, and these clouds weren't messing about. They had a dark, ominous quality to them, and it didn't take long for their relentless, blustery spray to interact with the intermittent sunlight to create rainbow after rainbow, each one dipping into the churning waves below, before fading away. They were appearing and disappearing at a rate I've seldom seen. A rainbow forms with the stormy clouds as backdrop. 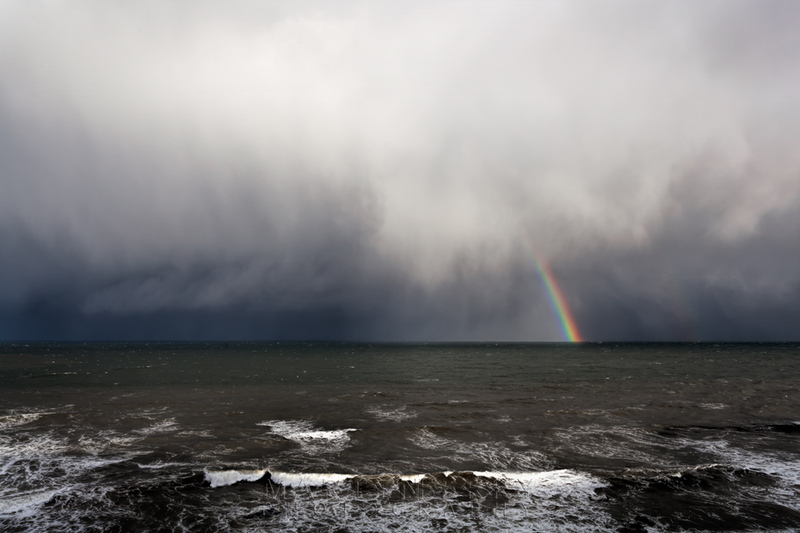 A wall of cloud hovers over the ocean shooting out rainbows. Needless to say, once it had moved on, I was fairly soaked. I continued on, trudging soggily along the coast towards Souter Lighthouse, but thanks to the bracing wind, even though it was an icy blast, it was strong enough to dry out my jeans pretty quickly, which was nice. With the sky growing darker another rainbow appears over the churning surf. By the time I arrived at the lighthouse the sun was starting to make an appearance again. Opened in 1871, Souter was the first lighthouse in the world to be designed and built specifically to use electricity, and utilised the most advanced lighthouse technology of its day. It was sorely needed, due to the number of wrecks on the dangerous reefs of Whitburn Steel, which lie directly under the surrounding water. In one year alone – 1860 – there were 20 shipwrecks. This contributed to making this coastline the most dangerous in the country, with an average of around 44 shipwrecks per every mile of coastline. The lighthouse was decommissioned in 1988, but continued to serve as a radio navigation beacon up until 1999 when it was finally closed. It is owned by the National Trust and open to the public, but it was closed when I visited. The foghorns produced a five-second blast every 30 seconds in poor weather up until 1988, when the lighthouse was decommissioned, they remain in working order and are sounded on special occasions throughout the year. After getting a few shots of the striking red and white structure I felt the weather closing in again as hailstones started to pop off the hood of my jacket. 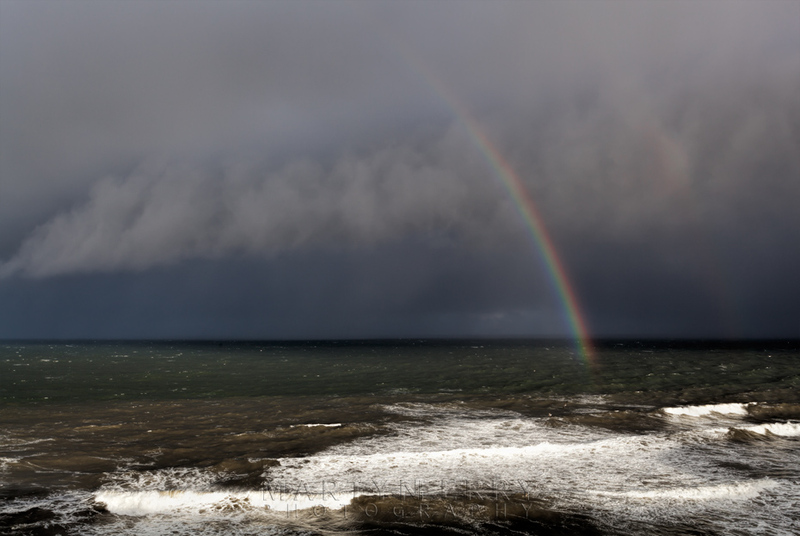 As yet again rainbows began to appear over the ocean, I tried to get some shots, but before I could get anywhere, the rain came down with a vengeance and I had to concede defeat. The weather became more sombre as the sun began to set. I made a dash for the lighthouse in an effort to get some shelter behind the foghorn, but the rain had the upper hand, and by the time I'd made it I was thoroughly drenched again. It was definitely one of those days.